Director/Creature Design – Larry Fessenden, Screenplay – Tony Daniel & Brian Smith, Producers – Larry Fessenden & Peter Phok, Photography – Gordon Arkenberg, Music – Will Bates, Visual Effects – Neal Jonas, Creature Effects – Fractured FX, Makeup Effects – Brian Spears, Production Design – Tania Bijlani. Production Company – Glass Eye Pix/Offhollywood Pictures. Johnny joins a group of friends as they head up to Black Lake to party following school graduation. Johnny’s grandfather used to come there and his friend Mr Parks warns Johnny about going out on the lake. As the group set out to cross the lake in a small boat, Johnny is anxious, wanting to get to the other side quickly. However, the others want to jump into the water, swim and fool around. The boat is then abruptly attacked by a giant fish that gores and kills one of the girls. Huddled in the boat, the others try to make it back to shore but the fish eliminates both the paddles and puts a hole in the side of the boat, causing it to start flooding. The group throw the dead body overboard to distract the fish so they can start paddling to shore with their hands. After the fish is done with the body and returns for them, they debate who on board they can next throw over to distract it. The ruthless determination to survive, as well as secrets concerning the remaining girl, brings out tensions between those remaining that prove as deadly as the menace lurking in the water. Larry Fessenden is an independent director of some promise who has been gradually making a name for himself for nearly twenty years, even if most of his films remain under the commercial radar. Fessenden’s growing reputation is such that even gets a chapter devoted to him as one of the auteurs in the 2011 updated version of Kim Newman’s Nightmare Movies (1988). Fessenden began in low-budget horror films with No Telling (1991) and went onto the vampire film Habit (1997), before graduating to the better budgeted Wendigo (2001), the impressive environmental horror The Last Winter (2006) and subsequently the N is for Nexus segment of ABCs of Death 2 (2014). Fessenden has also acted as a producer for a number of other horror films via his Glass Eye Pix production company, including the likes of The Off Season (2004), Zombie Honeymoon (2004), The Roost (2005), Automatons (2006), Trigger Man (2007), I Can See You (2008), I Sell the Dead (2008), The House of the Devil (2009), Satan Hates You (2009), Bitter Feast (2010), Stake Land (2010), Hypothermia (2011), The Innkeepers (2011), Late Phases (2014), Darling (2015), Most Beautiful Island (2017), Psychopaths (2017) and The Ranger (2018). Fessenden has also made a number of appearances in other films as an actor, including bit parts in Bringing Out the Dead (1999), Session 9 (2001), Broken Flowers (2005), The Brave One (2007), You’re Next (2011) and We Are Still Here (2014). Beneath feels very different to the type of film that Larry Fessenden has made before (although the film would in fact appear to be the expansion of Jaws (1979), a short film the young Fessenden made using toys). It starts out seeming like it is a teens in peril film and you wonder for a time if Fessenden has sold out on his indie sensibilities to make a formula horror film. All the familiar hallmarks of a typical slasher film soon kick in – the teens fooling around, the bullying jocks, the sensible kid trying to voice warnings and being ignored, Mark Margolis as the equivalent of Friday the 13th (1980)’s Crazy Ralph giving wild-eyed warnings about the dangers in the lake. There is even one of the girls named Deborah Voorhees, which surely spells out homage for all to see in a neon light. As the kids set out onto the lake, it feels like we are in for a feature-length version of The Raft segment of Creepshow II (1987), which was similarly premised around a group of teenagers trapped in the middle of a lake by a creature that lurked in the water. There is the odd amusing line, like where one of the teens tries to find an analogy for dealing with the situation they are in “Have you ever seen the movie Shark Night 3D ?” which seems to be heading to a wittily sarcastic area that the film never visits again. Even when the fish creature appears with its ridiculous ping-pong bug-eyes like something out of a Larry Buchanan film – see Zontar – The Thing from Venus (1966), It’s Alive! (1969) – Beneath seems to be heading down to not very promising depths. Then surprisingly Beneath starts getting good. Extremely good. The standard slasher movie set-up has only been a half-hour lead-in to get us to where Fessenden wants the film to go – the contained situation in the boat where the teens start debating what to do and conclude that their best means of survival is to start throwing members of the five-person group overboard. At this point, the film becomes less a monster movie and more like one of the containment dramas of the last few years where filmmakers seemed to be competing amongst themselves as to how small a space they could set a film – see the likes of Phone Booth (2002), Buried (2010), Frozen (2010), The Night Chronicles 1: Devil (2010) and ATM (2012). 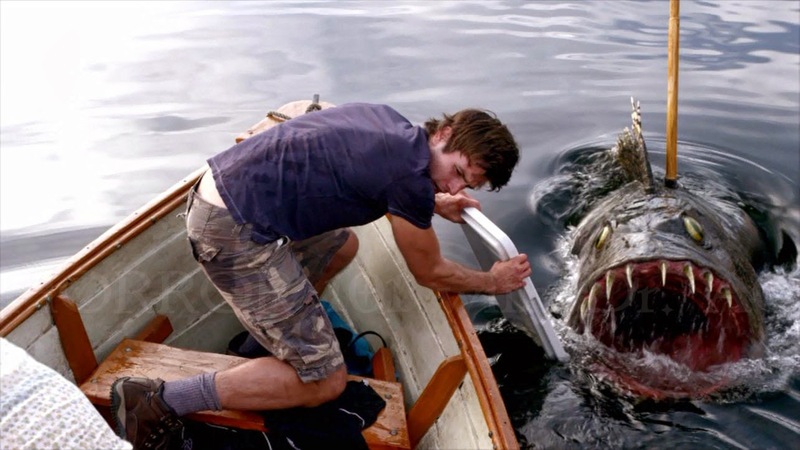 The monster becomes peripheral to the main action – represented the same way that Steven Spielberg did with the shark in Jaws (1975), less by actually being seen than by either a fin or the protruding stick of the oar that one of the teens has impaled in it gliding through the water. The real drama becomes the increasing brutality of the situation on board the boat that proves just as dangerous as the lurking fish – the arguments as to why they should throw others among the group overboard to distract the fish while they row to shore, not to mention the sexual tensions over the girl that come to the fore and produce a wedge of jealousies. These end up creating some remarkably brutal tensions.